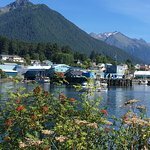 Sitka Scenic Tour- Premium - Alaska Raptor Center, Fortress of the Bears,Totems! Skip the impersonal, large–group bus tour and explore Sitka on a small–group day trip to the city’s top landmarks, with a range of departure times offered to fit your schedule. 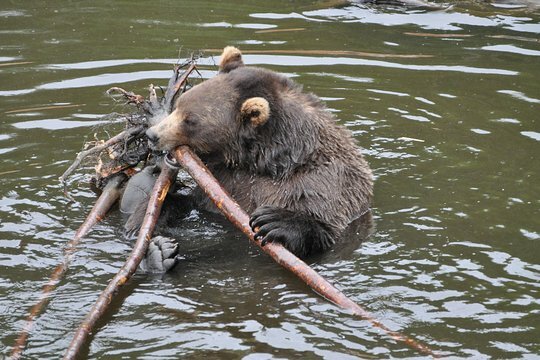 Your guide, who navigates for you, brings you to four highly–rated attractions, including Fortress of the Bear, the Alaska Raptor Center, and the Sitka National Historic Park. All entrance fees are included for your convenience. After taking the free ship shuttle to town, where you will meet the owners of your small group tour at the Harrigan Centennial Hall. After being introduced to your guide you'll board a comfortable 10-passenger Nissan NV van to start your adventure of Sitka, situated on the edge of Baranof Island at the end of Alaska's famous Inside Passage. 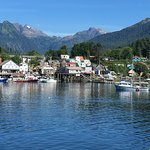 Silver Bay: Your local guide narrates what life is like in Sitka as you drive south to Silver Bay. Here, incredible beauty unfolds around each and every bend in the road. We will stop for an amazing photo opportunity and possible wildlife viewing. We often see whales, eagles, sea lions and salmon jumping. Fortress of The Bear: Next your tour brings you the “Fortress of the Bear”, our most popular stop. 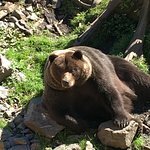 Here you will have the opportunity to get within twenty-five feet of our distinctive Brown Bear in a naturalized setting. The three-quarter acre habitat, set against the National Forest, is the largest bear habitat in North America and is complete with covered viewing areas. Meet their experienced rescuers as they share their love and knowledge of this often feared, but yet revered creature of the forest. Learn the challenges they experience as they seek to rescue these incredible giants. 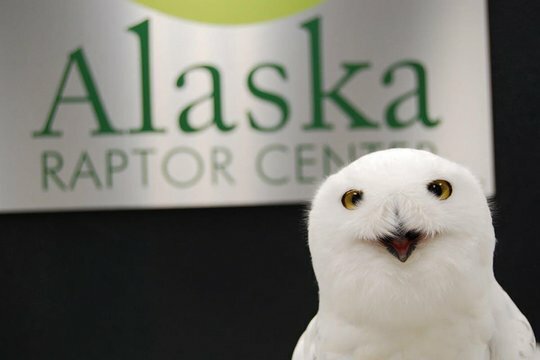 Alaska Raptor Center: Next you will start your private small group tour of this amazing raptor rehabilitation center. Located on a 17–acre campus bordering the Tongass National Forest and Indian River, its primary mission is the rehabilitation of sick and injured eagles, hawks, falcons, owls, and other birds of prey which are brought in from all over Alaska. The Center (the largest of its type in the state, and one of the largest in North America) receives between 100–200 birds a year, with many suffering from gunshot wounds and traffic accident-related trauma. 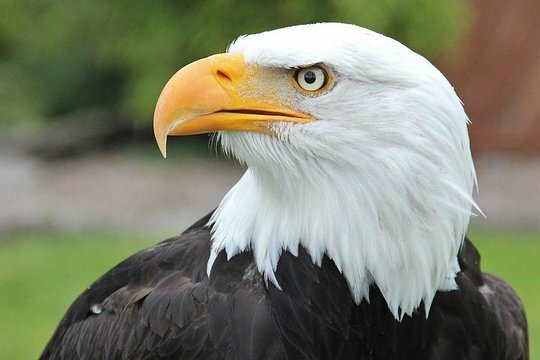 The Center's goal is to introduce the birds back into the wild, once they are healed and retrained in "raptor life skills" (such as flying) in the enclosed, Bald Eagle Flight-Training Center. A few of the animals that could not be returned to nature have become permanent guests. You will see up to two dozen resident eagles, hawks, owls, and ravens, who assist in the Center’s secondary function, that of public education. Sitka National Historical Park: You continue to the oldest national park in Alaska: Sitka National Historical Park. You'll be amazed as you stroll among the stunning Tlingit and Haida totem poles amidst hemlock and spruce trees on the scenic coastal trail. After, join your guide on a beautiful walk overlooking the Indian River. In the middle of the season, witness salmon spawning while your knowledgeable guide teaches you about the amazing life cycle of the salmon. All Guests will be given the choice to drive back with your guide or stay longer and stroll the beautiful Sea Walk back to town a 15-20 minute stunning walk. 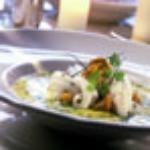 We are so glad you choose us on your stop in Sitka! Thank you for you kind words! We love showing off our amazing city with you! Come back soon! Wonderful work done by center to take in these birds of prey and effort to re-introduce them into the wild. Well worth short walk from town of Sitka. Maria is awesome I'm glad you had a great time! 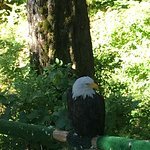 Get quick answers from Sitka Scenic Tour- Premium - Alaska Raptor Center, Fortress of the Bears,Totems! staff and past visitors. How long is the excursion. Need to be back on board ship by 3 pm. As already mentioned we spent about 15 min on the island. Most of the old base is a school and closed to the public. The day we were there the AK Highway Patrol School was teaching high speed car handeling which was fun to watch. Hello! Do you have to pay for a child 1 year and under? Thanks.